Buy A Friend A Book Day! Happy Buy A Friend A Book Day! It’s simple. Buy a friend(s) a book today. Any book you want. 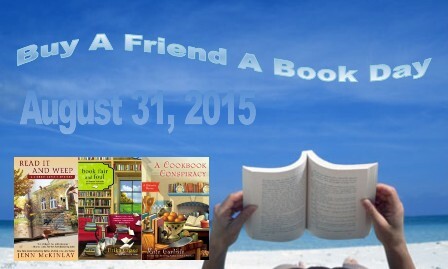 Introduce your friend to a new author or series, or buy your friend a book that she / he has been wanting! It’s that easy. Just buy a friend a book! Lisa at Lisa K’s Book Reviews is hosting the event on Facebook! To celebrate I am giving away 3 bookish books! Only requirement – you must be a follower of this blog in some way! Winners will be announced tomorrow morning!! *Click on Book Covers to go to Amazon for more book info. Awesome books! Thank you for the chance! Spotlight/Giveaway/News from Nancy Martin Cozy Wednesday with Nancy Haddock – Author of Basket Case – Giveaway too!